Last week a brand new festival celebrating Scottish Culture from Burns to present day ran a number of events across the city. 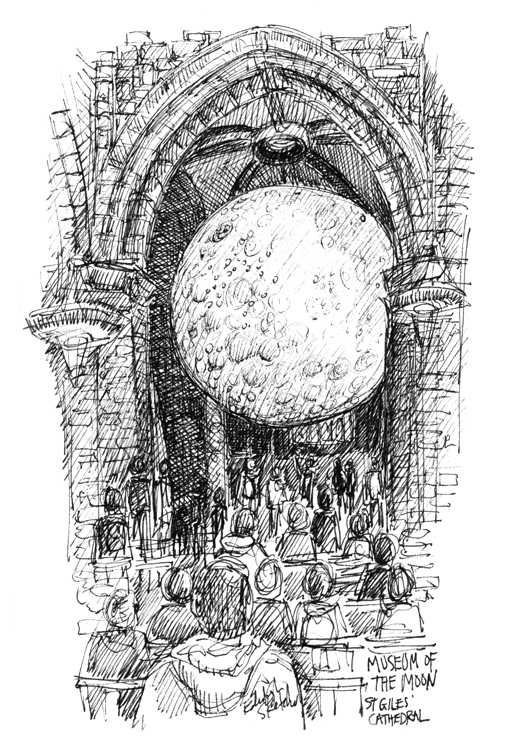 One such event saw a huge (7 metre) illuminated moon seemingly floating between the arches of St Giles Cathedral. The installation by artist Luke Jerram was amazing to see, being so large and in such an unexpected loaction. I loved it as did all the people walking around it at the weekend when I visited and made this sketch. Congratulations to all involved this event certainly got people talking and I could see all generations were enthralled to see the ‘moon’ up close.